A shabbily dressed woman sits on a park bench on fine afternoons doing crossword puzzles in Latin or reading a book. Another women from a nearby neighborhood walks by and slips her a little money, money the shabbily dressed woman doesn’t need because she happens to be Jessica Palinode, the daughter of an intellectual and artistic family that may be past its prime but has no need to go begging. They do, however, need police help because it appears a poisoner is among them. Two of the Palinode siblings are recently and suspiciously dead. He hurried away. This time the ancient spell must not be permitted to work. In an hour he must telephone the Great Man and accept with gratitude and modesty the great good fortune his friends and relations had engineered for him. Unfortunately (fortunately), before the hour comes to make the call and accept the honored position his mysterious family connections have brought, Campion sees a note to his valet, Lugg, asking for help with a situation connected to the Palinode case. Lugg’s brother-in-law, an undertaker, fears for his business if he exhumation of the first Palinode body is required. For Campion, this note is one coincidence too many, and he decides not to accept the honor from the Great Man but instead take up residence in the boarding house where the Palinodes live and find out what’s happening. This 1949 Margery Allingham novel reads like a straight-up whodunit. There’s a large, quirky cast of characters, lots of clues and red herrings, and a couple of twists. To me, the plot seemed unnecessarily complex, with a few too many characters. And as usual, I’m not sure it’s possible to solve the mystery without a lucky intuitive leap. Indeed, one character does essentially crack it in just that way, but at that point, Campion has found his killer. This mystery did seem more solvable than some–it may just be my own lack of skill (and interest) in cracking the case that kept the solution from me. That and the fact that there are at least three separate, but slightly connected mysteries here. For me, the pleasure in a Campion mystery is not so much in the mystery as in the scenes, and this book has some good ones. There’s Campion sitting in the kitchen watching the eccentric Jessica brew concoctions that are part of her scheme to live on next to nothing. And a police chase of a coffin brake (a sort of horse-drawn coffin cart). And any scene involving Lugg. There’s not, however, enough Amanda, although she does manage to steal the ending. But there weren’t quite enough good scenes to make this a favorite Allingham novel. Sweet Danger, The Curse of the Late Pig, and Traitor’s Purse are all far better and probably my favorites of the Campion books I’ve read so far. I love these old fashioned mysteries this isn’t one I’ve read before. Allingham is great for anyone who loves classic mysteries. This is one of her books – like Police at the Funeral – where I felt confused and lost through most of the story. I’ve been meaning to re-read both, and see if I can make better sense of them. Yeah, the mystery in this one had too much going on. I liked lots of scenes in it–Jessica Palinode in particular was a hoot–but the story as a whole wasn’t one of her better ones. I’ve just started reading the Albert Campion series (I’ve read Mystery Mile and am currently reading Look to the Lady) and am really enjoying them. Like you, it’s not so much the mystery itself as Allingham’s writing that pulls me in. The confrontation scene between Campion and the villain in Mystery Mile comes to mind, but also less climactic, more amusing scenes as well. Look to the Lady is another one I liked a lot. Those early books are fun when read purely as adventure stories–the mysteries were too complicated for me. And as the series goes on, Allingham lets the characters and her style evolve, and I’m enjoying that. 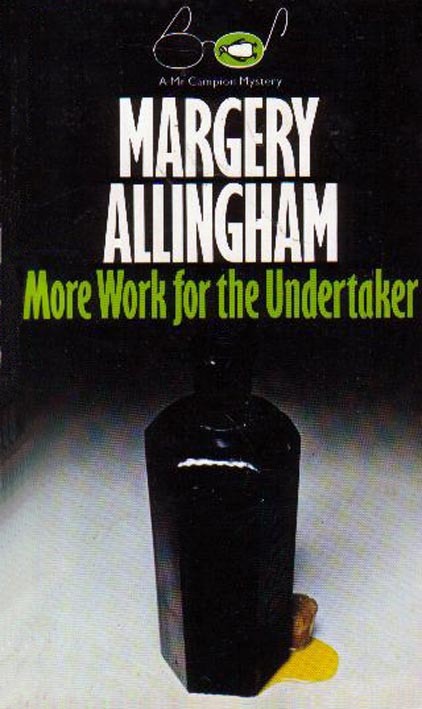 This was the first Margery Allingham book that I read and it won me over immediately. I should re-read it some time.